Your shrubs are looking pretty great. Next thing you know, they start looking rather full-bodied. Now they almost seem like they’ve taken on this snide attitude. Actually, you just decided they need to be taken down a few notches — but you’re not really sure how to go about the mysterious craft. This is when you should implement winter shrub care. Although it might go against what you believe in your heart of hearts, winter pruning is the best thing you can do for your plants. It’s the time of year when pests are less likely to infiltrate fresh cuts and when you can actually see what you’re cutting. Different plants need attention at various points in the year. If you’re unsure of when to begin pruning the specific plants you own, consult Better Homes & Gardens. Pruning your shrubs is a great way to stimulate growth, remove dead or diseased limbs, shape up shrubs to your liking, and improve flower or fruit production. In the winter, you can see the branches and overall shape of your shrubs to make informed trimming decisions. However, you absolutely want to be sure that you’re pruning in the right spots. Just lopping off random limbs and branches could mean preventing beautiful flowers from sprouting in the spring. There are two main methods you can use to prune your shrubs: thinning and heading. Thinning is a technique that promotes air movement and increased lighting throughout your plants by removing entire branches. 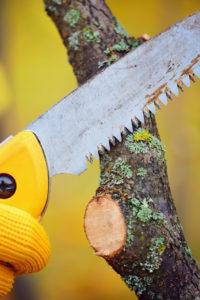 To execute this, you’ll want to make your cut just outside of the branch that is connected to the limb you are removing. It should leave just a thin raised edge, because cutting too far into the supporting limb leaves your plant vulnerable to disease. The other technique, heading back, is for shortening the length of a limb. Just like the thinning technique, a proper heading back cut does not leave a stub. Leaving stubs invites rot and creates an inviting environment for insects and disease. To avoid this, make your pruning cut at a slight angle above the bud or side branch. Whichever method you use, make sure to pick a clear, dry day for winter shrub care, and to use properly sharpened equipment. Cutting back ornamental grasses before spring begins is necessary if you want to avoid a messy tangle of grass when everything starts growing. Otherwise, you end up with ornamental grasses that have dead blades, new blades, and everything in between all jumbled up. Before you begin, find some gloves and long sleeves. Some ornamental grasses are thick and can cut up your arms and hands if you’re not cautious. Once you have your gloves and long sleeves on, gather up all the blades like you would a ponytail. You can use string, tape, or bungee cord to hold everything together. After bundling, you can take pruning shears and cut the grass back to the appropriate height. For example, monkey grass should be cut to around 3 inches and some sea grass should be cut to about one foot. Regardless, it’s a mess-free cleanup because the ponytail holds all the blades together. Pruning your shrubs and ornamental grasses is a rewarding activity. It’s like finally getting a haircut after a long summer. Pruning does take a long time though, especially for beginners. Make sure to budget enough time and frequent breaks so you don’t get frustrated and quit halfway!